Elite3 and Team are pleased to inform you that we have a new listing: 45 Kingsford Place, Oakville and the list price is $2,380,000 . 45 Kingsford Place is a sophisticated family residence located in a prestigious southeast Oakville neighbourhood. 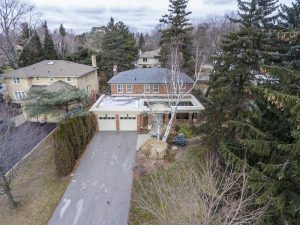 Situated on an expansive lot, south of Lakeshore Road and minutes from the shores of Lake Ontario, this home boasts 2700 square feet. With elegantly designed, 45 Kingsford Place features multiple fireplaces, spacious bedrooms, a wine cellar, and a large private backyard. Double doors made with custom African Mahogany wood open up to the main foyer, with travertine tile flooring and elegant finishes. The main floor features walnut hardwood floors, large baseboards, crown moulding, and wide windows that fill each room with natural light. A gas fireplace surrounded by beautiful stone gives the front dining/living room a comfortable atmosphere. Another gas fireplace with a stone hearth is featured in the family room, and picture windows overlook the backyard. Adjacent is the gourmet kitchen. Spacious and bright, the kitchen features classic white cabinetry, black granite countertops, stainless steel appliances, and a 9.5 foot island. The custom dark-oak staircase leads to four spacious bedrooms, each with crown moulding, large windows, and California shutters. The master bedroom features a large walk-in closet and a five-piece bathroom, with double sinks, a soaker jet tub, and a glass shower room. The three additional bedrooms share a bathroom with double sinks, a wall-to-wall mirror, a bathtub, and a shower. The finished basement is a highlight of the house, with 8.5 foot ceilings and a wood-burning fireplace surrounded with slate finishes. The large recreation room is perfect for entertaining, and the fifth bedroom and three-piece bathroom are ideal for guests. The basement also features a home gym and a wine cellar that can store 400 bottles, with hardwood floors and slate walls. 45 Kingsford Place is a large property, with a fenced-in backyard and towering trees. With professional landscaping, a large patio, and a gazebo, the backyard is a great place to spend time outdoors. This property also has close access to Lake Ontario, Chancery Promenade, Joshua’s Valley Park, and a number of walking trails. Southeast Oakville is known for its great schools, including Maple Grove Public School, Oakville Trafalgar High School, St Vincent Catholic Elementary School, and Clanmore Montessori School. This family-oriented community has a number of local resources, such as Maple Grove Arena, Oakville Place, and Ontario Racquet Club. This location is also close to Clarkson GO Station, Oakville GO Station, and highway QEW, perfect for east and west commuters.